If you would like to find out as soon as we announce more information on new artworks, workshops or kits please sign up to our newsletter! Join us at the Craft & Quilt Fair in Hobart where we will be exhibiting a collection of our embroidered artworks and hosting a series of workshops. These will showcase our less traditional take on stitch samplers and our water colour inspired stitching. Held across a morning and afternoon session with a break for lunch and to visit the fair for the students. An ode to cosy and colourfully patterned knit sweaters. Our Sweater Letter workshops bundle up the main embroidery stitches for beginners and demonstrate how you can use the simplest of stitches to create a variety of textures. Suitable for all levels. A twist on the traditional monogram and thank you letter. This workshop is based on our series of 'Thank you' artworks that we create using our trademark colourful 'painting with thread' style to embroider a colourful and painterly monogram. During the workshop we'll show you how we use watercoloured sketches for the basis of the lettering design and demonstrate the main stitches we use. Participants will then create their own watercoloured lettering to use for their embroidered monogram artworks. For this workshop we're encouraging everyone to throw away the stitch plan and embrace a freeform organic approach to embroidery. Suitable for all levels. Embracing embroidery as a mark making tool. Participants will create a contemporary stitch sampler using our trademark 'fractured pattern' style of embroidery where patterns of colour are layered on patterns of stitches. Suitable for all levels. A twist on the traditional monogram and thank you letter. This workshop is based on our series of 'Thank you' artworks that we create using our 'painting with thread' style to embroider a colourful and painterly monogram. During the 2 hour workshop we'll show you how we use watercolour sketches for the basis of the lettering design and demonstrate the main stitches we use. 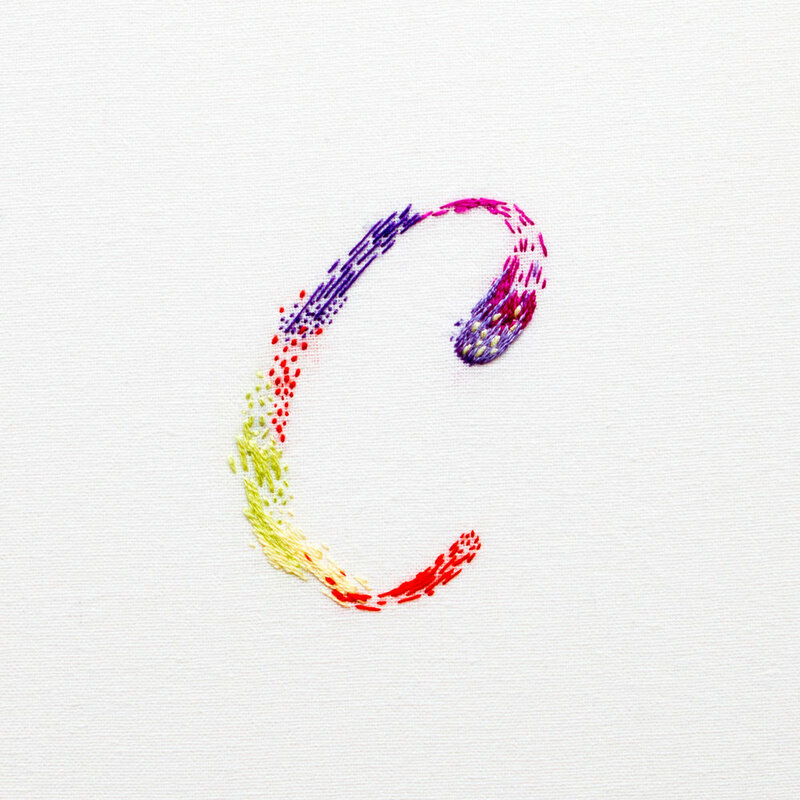 Participants will then create their own watercolour lettering to use for their embroidered monogram artworks. For this workshop we're encouraging everyone to throw away the stitch plan and embrace a freeform organic approach to embroidery. Where: At our studio at The Space Sydney in Alexandria. What you take home: your embroidered creation and any threads you may need to complete your artwork. Suitable for all levels. If you would like to join us for the Thank You Letter workshop please book here. We cannot refund bookings however if you are unable to attend you can transfer your booking to a friend. We need a minimum number of attendees to run our workshops, in the event we may have to cancel we will notify you by email and offer you a full refund or credit to use for another workshop date. 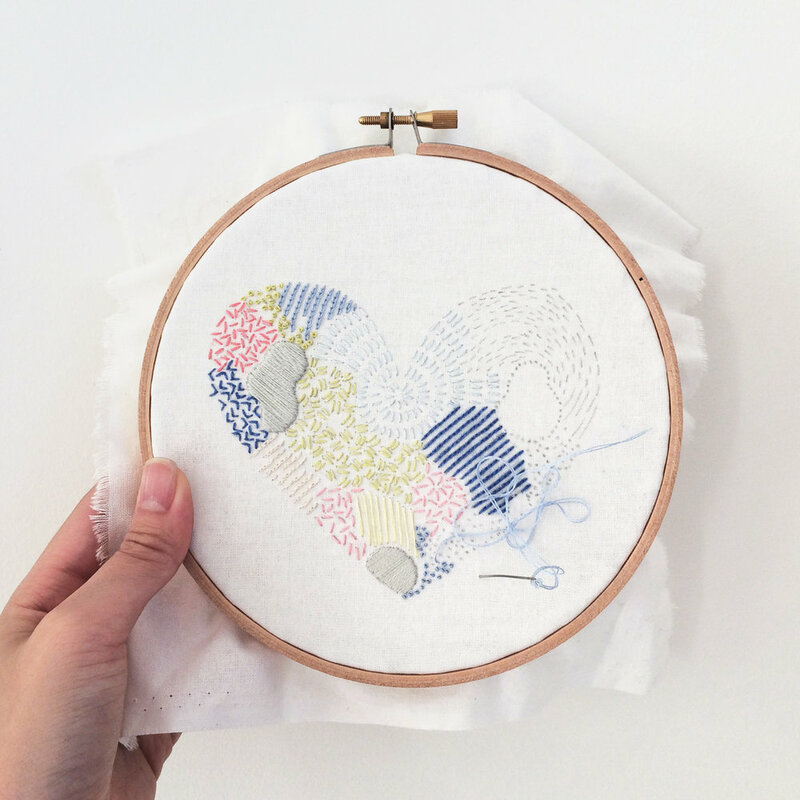 For this workshop we're embracing embroidery as a mark making tool and have created a special Heart graphic sampling some of our favourite patterns and stitches. Participants will create a contemporary stitch sampler using our signature 'fractured pattern' style of embroidery where patterns of colour are layered on patterns of stitches using a variety of stitch styles. If you would like to join us for the I Heart Patterns sampler workshop please book here. Join us at our studio for a special embroidery workshop where you will learn how to create your own individualised cosy Sweater Letter. During the 2 1/2 hour class you will learn and practice stitches on a sampler and then start your own M/M designed Sweater Letter to take home and complete. Tea and light snacks will be provided during the workshop. At our studio at The Space Sydney in Alexandria.